Why don’t our emotions come with a how-to guidebook? Is there a mental health walkthrough for life? Why doesn’t every school teach the basics of managing our emotions, self-care, coping, relationships, and being happy and fulfilled? The Mental Health Manual is Coco’s core “How To” book for mental health. Whether you have depression, anxiety, PTSD, panic attacks, or are doing pretty darn good and want to be at your mental best- there are practical insights and tools for everyone. These resources are great to share in therapy and great if you just want to work on polishing your mental game on your own. As always, if you’re doing more than just polishing up your mental health game, like if you’re trying to piece your mental health back together, keep it from falling apart, seriously struggling, or even just have questions like, “Is this normal? Is this a problem?” - that’s time to put down what you’re reading and pick up the phone (or email) to make an appointment with a mental health professional. The following links are The Mental Health Manual’s chapters and subsections in PDFs. New sections will be added as they are written. At the bottom, I’ll have an all-in-one PDF with all of the currently written sections combined. These PDFs will forever and ever and ever be free to everyone. If you would like The Mental Health Manual in another format or have any accessibility requests, please let me know. It is way harder to have good mental health when you have no idea how human emotions are supposed to work. Unfortunately, a lot of us were taught really misinformed and unhealthy and just downright untrue things about emotions. Sometimes people have mild anxiety and when they’re exercising regularly, it pretty much goes away. Some people might even have a full-on anxiety disorder that was a lot better after improving their diet. Who knows - that is them, not you. For most people? None of these things like sleep, exercise, diet will magically cure your mental health issues, but major problems in these areas can have a major impact on how intense your emotions are, how difficult it is to manage your feelings, can make it harder to control your impulses, make your mental health symptoms worse, and even impact your ability to concentrate, manage distractions, and remember things. You will have a hard time being healthy if these fundamentals are a hot mess in your life. 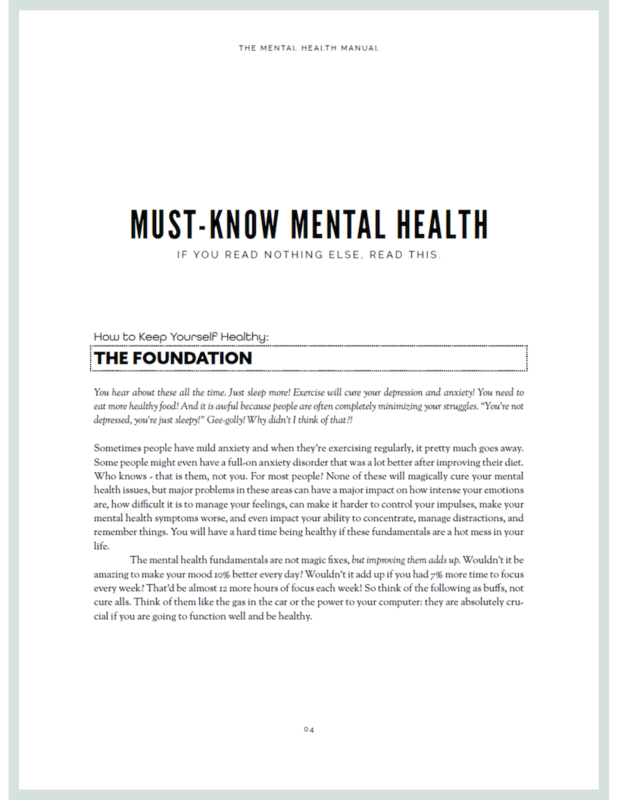 This chapter is the what, how, and why of your mental health foundation. CLICK HERE FOR A PDF WITH ALL CURRENT CHAPTERS.